The inner circle is the circle of control; because it includes the elements over which you are able exercise control and have been given responsibility. You’ll note that it is the smallest circle; there is very little in this life that you and I can actually control. For instance, I can’t control the traffic on my way to work, but I can control my response to that traffic. I can’t control the world’s economy, but I can control my spending and be fiscally responsible. I can’t control the outcome of my children’s choices, but I am able to control the instruction and discipline I give to them while they are under my authority. God has intentionally made my circle of responsibility the smallest. His Word gives precepts and commands so that I would know what my responsibilities are and obey him accordingly. As I walk in the Spirit, and not in the flesh, I am able to do everything that is within this circle (Gal. 5:16, Phil. 4:13). The middle circle contains the areas that touch my life, but over which I exercise limited control. A friend or a family member who is living a dangerous life style would fall into this category. Hopefully, through the years, my compassion and loyalty have won me the opportunity to speak to him about my concerns. Certainly, I have influence as a friend. Still, I have to remember, I do not ultimately control his choices or the outcome of those choices. He alone is responsible. He, too, has a circle of control. In the areas where I feel concern, I pray, and look for opportunities to minister. But when I think I can control my friend’s choices, I become manipulative. I use tools like shame or silence. I bribe him by holding our relationship hostage. To avoid this pattern, I remind myself of my responsibilities as found in 2 Timothy. And the Lord’s servant must not be quarrelsome but kind to everyone, able to teach, patiently enduring evil, correcting his opponents with gentleness. God may perhaps grant them repentance leading to a knowledge of the truth, and they may come to their senses and escape from the snare of the devil, after being captured by him to do his will [emphasis added](2 Tm. 2:24-26). Ultimately, I cannot make my friend change his mind. Only the Spirit of God can bring about repentance. In the areas where I am concerned, but cannot control I must learn to trust God. This is why prayer is a valuable replacement for worry. Every time I pray, I am trusting God to do in another’s life what I cannot do. Even when I am not manipulative, it is easy to drift from the middle circle into the outer one. Being concerned is only one step away from being consumed. I go to sleep thinking about the situation and wake up with it on my mind. It distracts me from the important conversations around me. It interrupts my relationship with God, and it intrudes upon my relationships with others. This is the circle of worry. I can’t seem to get my mind off the matter at hand. When I am in this circle, it feels like I should be able to come up with a solution if I only worry for a little longer. That is anxiety’s lie. Without realizing it, I have drifted from being concerned to being consumed. 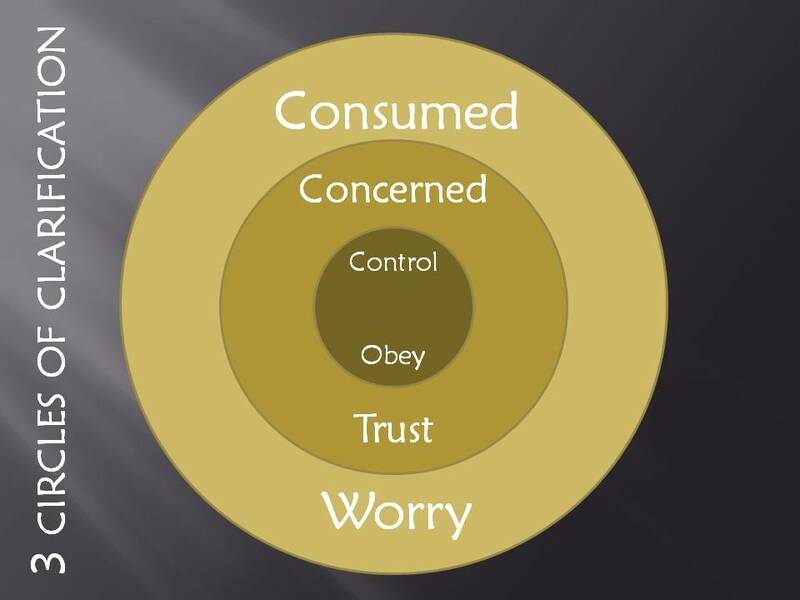 The three circles clarify an inherent danger when we move from the inner circle to the outer. The outer circle does not touch the inner. Which means, when I am worrying about a matter, I cannot fulfill my God-given responsibilities. My time and energies are wasted in the consumed circle and I have nothing left to spend on the areas that I am responsible for. This is why unchecked anxiety often leads to other sins. We’ve depleted the resources that God had given us to fulfill our responsibilities today because we were worrying about tomorrow. Jesus made this case in his Sermon on the Mount when he said, “Therefore do not be anxious about tomorrow, for tomorrow will be anxious for itself. Sufficient for the day is its own trouble” (Mat. 6:34). When something or someone is beginning to consume your mind, the three circles serve as a vivid reminder that you are not fulfilling your responsibilities. Stop obsessing over what you can’t control and give your best efforts to those areas that you can. Be faithful to do what God has asked of you. 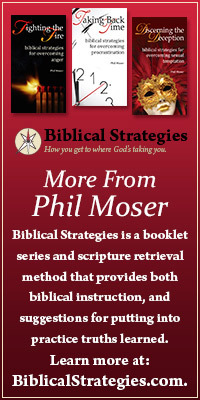 Taken from Safe in the Storm: biblical strategies for overcoming anxiety published by Biblical Strategies, 2013. This entry was posted in Biblical Strategies, worry and tagged anxiety, anxious thoughts, depression, responsiblity, worry.